The great world-spanning City of Chung Kuo see's the "War that wasn't a war" being fought between it's levels as the ruling seven T'ang struggle to maintain calm and prevent change. But this War isn't being fought on a battlefield, instead these combatants are employing a degree of subterfuge and guerilla warfare; from assassination to carefully placed bombs and stealthy poisoning - this dark shadow is striking the very heart of Chung Kuo. Increasing this danger of change is the existence of a document that claims to chart the true history of the world - not the version invented by the "Thousand Eye" Ministry who have maintained this fictional history for so long. This discovery could ignite the fuel for change and spell an end to the Han rule. There are however men still loyal to the Seven including General Tolonen who has recruited Gregory Karr and Kao Chen from the lower levels to aid his fight against the Dispersionists. It's his decision to destroy the newly-built generation-starship, "The New Hope" which will ultimately change Chung Kuo forever by declaring war on the Dispertionists. I've been looking forward to this book ever since I reviewed The Middle Kingdom back in September last year (where does the time go?) and it follows on very effectively from that book. There is a real sense of the grand about the story, a sense of epic scale rarely seen in other series that still manages to feel personal at the same time. It feels that the author is really getting into the swing of things too, the book has a steady pace that constantly moves the story forward with very little interruption or pause for breath; as such it's quite a fast read too. There are a number of different threads and the movement between viewpoints is handled expertly, not once causing confusion or disorientation and creating effective breaks in the narrative. There is a powerful message about the winners writing the history books here, in the case of Chung Kuo this injustice being the flame that ignites the fires of rebellion. Wingrove has a way of creating rich characters with just a few deft strokes of his pen, each of the major players coming across as reassuringly solid with an air of realism. It's the grand, sweeping story that brings it all together though, an incredibly detailed vision that has some stark parallel's to 21st century Earth and messages that feel quite relevant today. 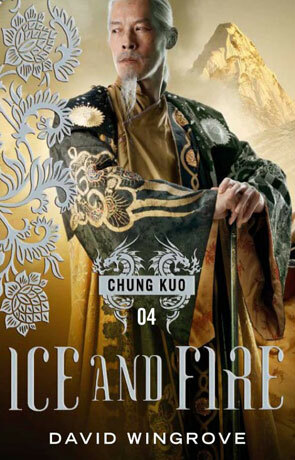 Ice and Fire is the book that really makes the Chung Kuo series feel like it's a part of a 20 volume epic; moving towards the inevitable path of change and culminating in a race to arms that has you eager to read the next in the series - The Art of War. Written on 26th April 2013 by Ant.